For the first time ever in 2019, Sporting Life Stories are proud to present a series of very special evenings with SIX TIME British Superbike Champion Shane ’Shakey’ Byrne. 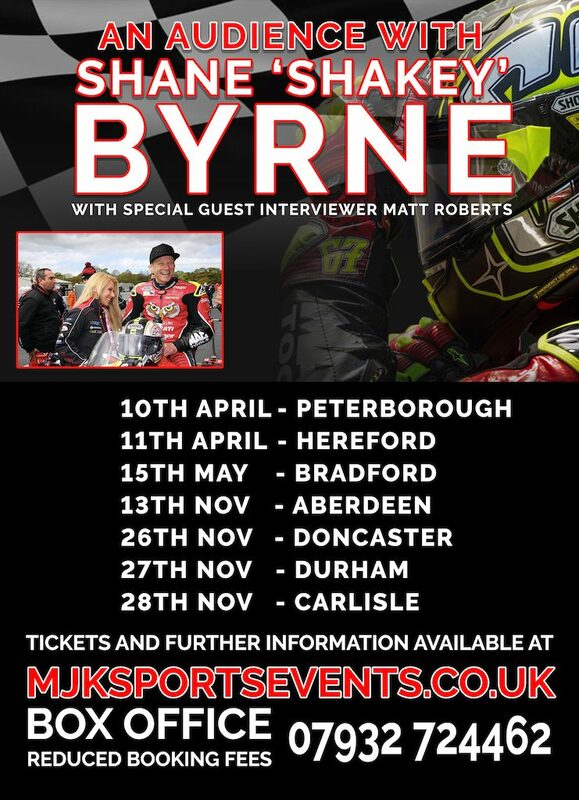 On Wednesday 15th May at Cedar Court, Bradford the most successful domestic British motorcycle racer of all-time and our special guest interviewer Matt Roberts will discuss the highs and lows of his incredible career, the crash that has threatened to end it and his plans for the future. From growing up on a council estate in Sittingbourne, working night shifts on the London Underground to fund his early career, to hitting the heights of World Superbike glory and two seasons spent racing alongside and partying with the likes of Valentino Rossi in MotoGP, Shakey has been there and seen it all. Byrne will also lift the lid on the darker side of the sport: the injuries, the underhand dealings and the backhanders that go on from club racing right the way to the very top. Combining the cheeky wit and charm that has made him a true fans’ favourite over the years, with the brutal honesty that has already established him as one of the sport’s leading television pundits, this is a night to be enjoyed by any sporting fan, and for bikers it promises to be truly unmissable. £30 Entry, show and a picture with Shakey that is printed on the night. £79 LTD to 20 guests. Entry, show and a private 30 min meet and greet with Shakey and Matt Roberts inc complimentary food and drinks. 19.30 Part one. On stage interview with our special guest Matt Roberts. Show and a picture with Shakey that is printed on the night. Entry, show and a private 30 min meet and greet with Shakey and Matt Roberts inc complimentary food and drinks. Purchase securely online or order tickets by calling our ticket hotline on 07932 724462. Select the number of tickets required and purchase securely online or order tickets by calling our ticket hotline on 07932 724462. All tickets will be emailed immediately following purchase. Event Sponsorship opportunities are available for this event that include naming rights, social media publicity, on the night publicity and a private meet and greet. For information please email info@mjksportsevents.co.uk or call 07932 724462. Invoices available via sales@mjksportsevents.co.uk or by calling 07932 724462. Registered in England and Wales No. 08599584. VAT Registration Number 207 2794 08.